For his first feature to be filmed outside of the United States, Academy Award®-nominated writer-director Paul Thomas Anderson turns to the world of dressmaking in postwar London, reteaming with his There Will Be Blood star Daniel Day-Lewis for a tumultuous and elegant gothic romance that is unlike anything in the filmmaker's wildly eclectic canon. 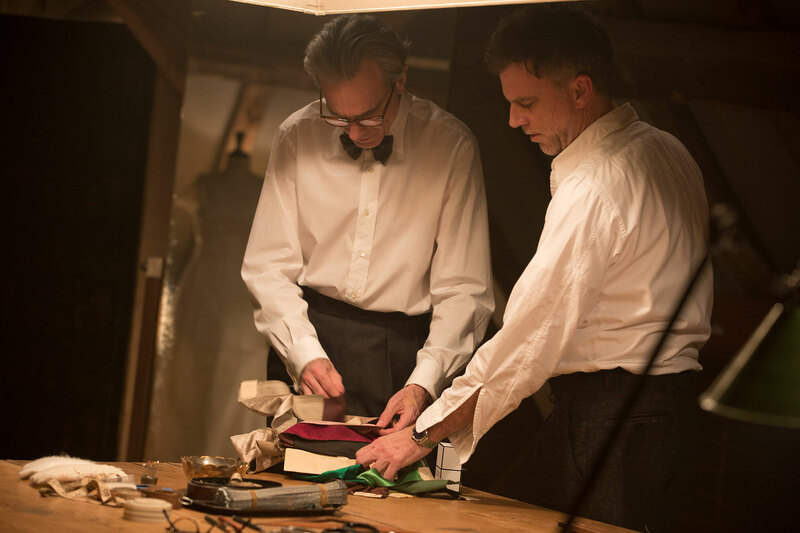 Focusing on fictional couturier Reynolds Woodcock (Day-Lewis), Phantom Thread unfurls as a love story between a master creator and his muse, whom the confirmed bachelor discovers during a weekend getaway in the English countryside. Co-starring Vicky Krieps as Alma and Lesley Manville, playing Woodcock's formidable sister Cyril, Anderson's eighth feature is awash in complex entanglements, meticulous detail and opulent atmosphere and decor. Anderson, whose most recent work includes music videos for HAIM and Radiohead as well as the 2015 music documentary Junun, had little interest in dressmaking or fashion history — until he began thinking about clothing after finishing production on his 2014 feature Inherent Vice. Some months later, as he was heading out to an event with frequent collaborator and Junun subject Jonny Greenwood, Anderson received a compliment from the musician on the cut of his suit. "He said something sarcastic to the effect of, Look at you, Beau Brummell," says Anderson. "I had to look the name up. I wanted to know more." As his interest in fashion grew, Anderson discovered the life and work of Spanish couturier Cristóbal Balenciaga (1895-1972), whose collections were internationally renowned for their iconic lacework, innovative cutting and shapely elegance. Immersing himself in Mary Blume's biography, The Master of Us All: Balenciaga, His Workrooms, His World, the writer-director became fascinated with the designer's monastic life and all-consuming approach to dressmaking, which dovetailed with Hollywood's Golden Age and the New Look in Paris, centering on Christian Dior and his reinvention of the female silhouette. With his handsome, angular features, Balenciaga also reminded Anderson of his There Will Be Blood star Daniel Day-Lewis, with whom he was eager to reunite for another project. "Daniel is so handsome, but we made a film together in which he was rather ugly in terms of character and setting," says Anderson. "I started thinking how I could make him more handsome, seeing how fashionable he was in his everyday life, and knowing well his love for clothing and grooming and making things with his hands." As a major Hollywood star who also happens to be trained shoemaker, Day-Lewis perfectly encapsulated the writer-director's burgeoning interest in Balenciaga. Anderson was also enamored with midcentury glamour and the gothic romance — specifically Hitchcock's Rebecca. He had already been thinking about a triangular dynamic for his next feature, comprising a man, a woman and his sister. "I was looking for the perfect venue for a story like this," says Anderson. "I wanted a setting that was high-class with characters immersed in finery — a world that could accommodate a gothic romance." With Day-Lewis intrigued about the project, Anderson and his star became devoted students of haute couture, learning everything they could about Balenciaga and his contemporaries, including British-born designer Charles James, who became a master cutter after relocating to Chicago at the age of 19, and Dior, who revolutionized female dressing around midcentury. They studied the artistic temperament of contemporary figures like Alexander McQueen, who early in his career wove defiant and lascivious messages into the suits and dresses he made for prominent clients including Prince Charles. "After the war, there were two parallel worlds of couture, one in Paris, which was the dominant world — the New Look — but there were plenty of other designers forging their way in London," says Day-Lewis "It felt right somehow that our work should reflect the history of England and the fabrics that came from the British Isles, which are extraordinary. The tailors and dressmakers are still making these garments, and they are beautiful. Every season when the fabrics arrive, they look at the fabrics, feel them, smell them, and make designs from them. There was something fascinating to us about the idea of England emerging from the war years, amid austerity." Narrowing their focus, the duo studied classic English tailoring, in particular the London couture houses that employed lesser-known craftsmen like Digby Morton, Peter Russell, Hardy Amies, John Cavenagh and Michael Donéllan in the years following World War II. While Paris was the epicenter of haute couture at midcentury, London was its more understated cousin, emphasizing the Savile Row tradition of bespoke tailoring. In contrast to the big houses like Dior, which employed hundreds of workers, the London houses were small, family-owned enterprises frequently run by male and female sibling duos. Creators like Amies and Morton started as apprentices and rose through the ranks to become head designers who at the height of their power dressed royals, aristocrats, socialites and luminaries of stage and screen. "In the world I was learning about, a lot of the head designers had sisters who ran the business," says Anderson. "This includes Amies in the earlier decades of the last century and Valentino and Versace in the present day." For a native Californian whose work has become synonymous with the San Fernando Valley in Los Angeles, Anderson was also keen on making a movie set in London — his first ever production outside of America. Day-Lewis for his part was eager to play another Englishman, having built his career in classic British works like My Beautiful Launderette (1986) and My Left Foot (1989), for which he won his first Oscar playing the writer and artist Christy Brown. For the last few years, Day-Lewis has played American characters, including the rapacious oilman Daniel Plainview in There Will Be Blood and the 16th President of the United States in Steven Spielberg's Lincoln, for which the actor won two more Oscars. During their extended stay in London, in which they frequently exchanged volumes on fashion and art in between visits to the Victoria and Albert Museum, where they studied vintage gowns by the likes of Balenciaga and Charles James, Anderson and Day-Lewis came to conceive the fictional couturier known as Reynolds Woodcock.